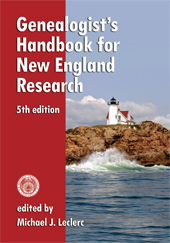 New England’s governmental organization is different from other areas of the United States, which can confuse genealogical researchers from outside the region. One major difference is in geopolitical subdivisions. Unlike other areas of the country, New England’s primary unit of government is the town. With a few exceptions, all land in each state is part of a town or city. Unincorporated territory exists only in the three northern New England states (Maine, New Hampshire, and Vermont); there is no unincorporated territory in Connecticut, Massachusetts, or Rhode Island. Land is primarily divided into towns and cities. Large towns will often have villages within them, but the villages have no political significance, and no records are kept on the village level. In other areas of the country, you will often find that the primary source of records is at the county level. This is not true for New England. Here you will discover many more records on the local level than the county level. Indeed, in Rhode Island, land, probate, and vital records are all recorded at the town level. County governments in Massachusetts have mostly been abolished, with the state taking over the counties’ former functions. Vital records in the six New England states are recorded at the town level. In some locations and time periods you will also find marriage records at the county level, but in most cases the town clerk was the primary recorder. Land records will occasionally exist at both the town and county level. Probate records were recorded at the town, district, or county level, depending on the state. Even if a probate district has the same name as a county, it is not necessarily concurrent. The New England practice of warning people out of town is one with its roots in English Common Law. Colonies defined requirements for becoming a legal settler. Newcomers to a town who did not qualify as settlers, and appeared as if they would not be able to qualify any time in the near future, were warned to leave town. Warnings were mainly given to prevent indigent individuals from becoming a public charge. Warning out records are available in many New England towns and can provide information on ages, children’s names, and places of origin for a newly arrived family. Ear marks and cattle marks are another helpful type of New England town record. People marked their animals so that similar-looking animals could be differentiated from one another and ownership determined. Individual marks could be passed from father to son. Since only one son could inherit the father’s mark, other sons created a version of their father’s mark to use as their own. Knowledge of local customs – and of discarded practices like warnings out – will aid the genealogical researcher in navigating the disparate historic records kept by New England towns, counties, and states. Adapted from “New England Records” in Genealogist’s Handbook for New England Research.